Shin Nippon Biomedical Laboratories, Ltd. (SNBL) is currently developing an intranasal (IN) formulation of the antimigraine drug zolmitriptan (development code: TRZ). SNBL has completed the nonclinical studies of TRZ necessary to apply for permission to begin a Phase 1 clinical study in the US, bringing TRZ a step closer to clinical studies. Migraine induces disabling headaches usually in the form of an intense, throbbing pain on one side of the head, which, when severe, can be painful enough to interfere with daily activities. This severe pain is often accompanied by nausea and vomiting, meaning that there is strong unmet need among patients for drugs that can provide rapid relief of pain, in a formulation that can be used instead of an injection. Zolmitriptan, the active ingredient in TRZ, is already used extensively as an antimigraine drug in clinical practice. SNBL has designed TRZ by applying an innovative IN delivery technology, μco™ System, in order to develop a new type of formulation enabling patients to receive rapid relief with an easy to dose, non-injection formulation. 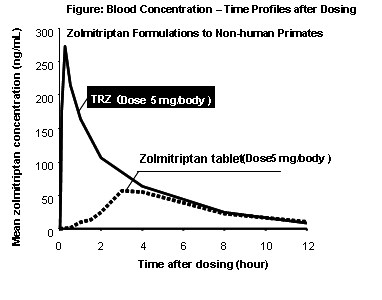 As shown in the figure to the right, in preclinical non-human primate (cynomolgus monkey) studies, TRZ was confirmed to be safe and demonstrated rapid and high absorption. These studies confirmed that, compared with the commercially available zolmitriptan oral tablet, the absorption of TRZ is both rapid - starting directly following administration - and high. These results suggest that TRZ is well positioned to become a new formulation that can provide rapid relief of migraine to patients. Going forward, it will be necessary to confirm the absorption, tolerability, and safety of TRZ in a Phase 1 clinical study in humans. SNBL has already requested a pre IND meeting*1 with the US Food and Drug Administration (FDA), and plans to submit an IND*2 by the end of 2010, and to report on Phase 1 data by March 2011. Approximately 28 million patients in the US - almost 10% of the population - and approximately 8.4 million patients in Japan suffer from migraine, contributing to a global market size of Y350 billion. Migraine prevalence peaks around patients in their 20s to 40s; these patients are typically in their most productive years and suffer significant anxiety about the sudden impact of migraine headaches on their daily lives. Patients are thus in need of new drug formulations that provide rapid relief of migraine. However, of the currently marketed formulations, as the only formulation capable of providing rapid, consistent efficacy is an injection, there is still strong unmet need among patients for an easy to administer, non-injection formulation that can provide rapid, consistent efficacy. As a result of SNBL's discussions with migraine specialists in the US, these specialists have suggested that, by replacing injections with a rapid acting product that is simple to use and convenient to carry, there is great potential for TRZ as a product that satisfies patients' unmet needs. SNBL has already completed a US Phase 2 clinical study of IN granisetron, an antiemetic drug based on μcoTM system, demonstrating excellent efficacy and safety (patient satisfaction: 96.6%). As TRZ is also based on μco™ System, the recently obtained TRZ nonclinical data provide further evidence of the wide applicability of this proprietary drug delivery system in the development of new formulations with competitive advantages over marketed formulations, including more rapid action, higher absorption, and improved convenience. Pharmaceutical companies are currently expressing great interest in this type of efficient drug development model, and SNBL is already providing feasibility studies allowing a number of pharmaceutical companies to assess the application of μco™ System to their own compounds. Going forward, SNBL plans to complete the Phase 1 clinical study of TRZ in a timely manner, to begin Phase 2 around September 2011, and to complete Phase 2 around March 2012. At the present time, the effect of this matter on the earnings of SNBL's current term is minimal.